If you’ve never tasted a mango, you’re in for a rare treat. You’ll wonder why you’ve never tried it before. It’s a mixture of sweet and tangy—like an orange crossed with a papaya and a peach. In a word—it’s amazing. On top of that, it’s good for you. If the tangy, acidic taste leads you to assume that it’s high in vitamin C, you’d be correct; a single mango has 203 percent of your recommended daily requirement for it. Vitamin C is important for the growth, maintenance, and repair of tissue, bone, and teeth, according to the University of Maryland Medical Canter. Eating one mango also contributes almost three-quarters of your daily requirement for vitamin A, which is similarly important for healthy skin, teeth, bones, and mucous membranes. Vitamin A also promotes good vision. Rarely, people have an allergic reaction to mango, especially to its skin. If you tend to react to poison oak, ivy or sumac, it’s worth taking care to avoid touching the mango skin, as these plants have something in common—they all come from the same plant family and contain the irritant urushiol. For years, the Tommy Atkins mango has been the only mango variety available in U.S. grocery stores due to its Florida origins, ability to travel well, and decent shelf life. However, that variety tends to have a very fibrous texture, and is not quite as flavorful as other varieties. Having recently eaten an Ataulfo mango, which has just come in season, I can attest to the much better flavor of the Ataulfo. 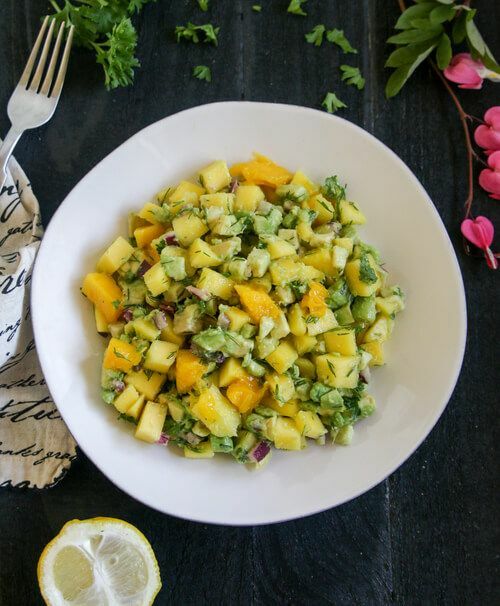 Mangos can be enjoyed on there own, or in a simple salad like this mango and avocado salad.